Akamandisa, Pastor Kalonga, and Zhingisa learned from other African microfinance practitioners while teaching what they learned during the risk management training in Burundi. 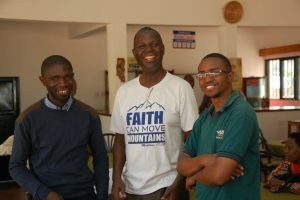 All three of the key CEMFIN staff – Pastor Alick Kalonga, Zhingisa Luneta, and Sitale Akamandisa – were invited and sponsored by PEER Servants to attend July risk management training hosted by Hope Fund Burundi in Bujumbura. The CEMFIN staff learned very practical lessons that they look forward to applying in Mongu on their path to creating a sustainable, transformational microfinance institution to extend more of the kingdom to the materially poor in Western Zambia.